1Department of Health Education and Health Promotion,Shiraz University of Medical Sciences, Shiraz, Iran. 2Maternal-fetal Medicine Research Center,Shiraz University of Medical Sciences, Shiraz, Iran . 3Department of Epidemiology,Shiraz University of Medical Sciences, Shiraz, Iran. Objectives: Childbirth is a physiological process that terminates the pregnancy which during it a baby is born, therefore, in parallel, the method of delivery is very important. Despite recent medical advances, one of the fundamental problems of midwifery and health system in Iran is the increase in Cesarean Section (CS) rate and complications in related with this problem. 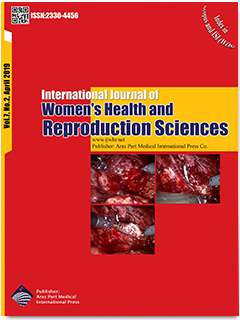 Materials and Methods: This is an interventional, semi experimental study which surveys 87 primigravida women who referred to obstetrics and gynecology clinics affiliated to Shiraz University of Medical Sciences for receiving prenatal care in 2014. After doing the pre-test, educational intervention was conducted in the intervention group. The post-test was carried out one month after completion of the intervention. Then, the data were analyzed by the Statistical Package for the Social Sciences (SPSS), version 20 using statistical tests of the Chi-square, T tests, ANCOVA, Spearman’s correlation coefficient, and nonparametric tests. Results: The results showed that there are statistically significant differences in the mean scores of structures of behavioral beliefs, outcome evaluation, attitude, control beliefs, perceived power, and perceived behavioral control between the pregnant women of intervention and control groups after the intervention (P<0.05). Conclusion: According to the results, it’s recommendedto use national health-care policies for planning, implementation and evaluation of consultative-educational programs in order to broadcast the culture of Normal Vaginal Delivery (NVD), and reduce the CS rate based on the theories of behavioral changes.